I am currently involved in a project where we need to provide our users the ability to re-send a file(message). I use the term file as this BizTalk application consumes files from various source systems and sends them to internal/external destination systems primarily as files. Retrieving tracked messages from HAT is not a complex task, however we want to provide our users with some visibility into what files BizTalk has moved and give them the ability to re-send them if so desired. There is a class called MSBTS_TrackedMessageInstance2 that allows tracked messages to be saved to disk. This class can be called through a .Net Web App, WinForm app, BizTalk app ..etc. To keep things simple for this blog, I have included some POC code that is called from a Windows Form app. 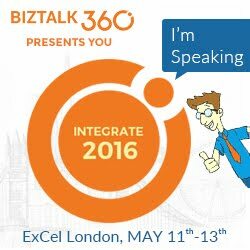 Be sure to include using System.Management; and include a reference to Microsoft.BizTalk.Operations. When the message is written to disk, both the context xml file and the message are written as two separate files. This action generates the same output that HAT does when you issue the "Save All Tracked Messages" command. Some of the important things to note in this code is the name of your BizTalk Management Database - BizTalkMgmtDb. This is significant because the name of your Tracking database is found in the BizTalkMgmtDb - adm_Group table. This is important as your run time BizTalkDTADb cannot grow to infinite size and still be performant. Having this TrackingDBName field does allow you some flexibility as you are then able to specify another BizTalkDTADb which represents a long term archive. You would not modify your primary Management Database to do this. That would break your BizTalk runtime. What you can do is create a copy of your Management Database and then modify this value to represent your long term archive. So you essentially have two management databases and two tracking databases. By creating a copy of the Management database, you can then update this TrackingDBName field to reflect your long term archive tracking database. 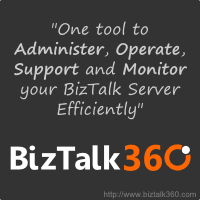 This allows you to keep your run time BizTalk environment lean and mean while still having long term archived messages. The MessageInstance ID is also a critical parameter in the WMI call as it is able to uniquely identify the message and is based upon a GUID. The MessageInstance ID can be retrieved via a couple methods. One way is through HAT. When you view the Message flow for a particular message, the MessageInstance Id is one of the context properties that is tracked. Another way of getting this value is through the context properties of the incoming message. Suppose you have an inbound message called msg_In. You could retrieve the id for this message by getting the value of msg_In(BTS.MessageID). As part of our project, we track this MessageInstanceId in BAM. We have a custom ASP.Net web page that queries the associated BAM view in order to retrieve the MessageInstance ID. One nice thing about tracking the information in BAM is that we can also track other meta data about the file movement such as the File name, Date/Time, Source/Destination locations and several other fields. This allows our users to query upon several different parameter combinations in order to find the particular file(message) that they are interested in. I plan on blogging more about the BAM portion of this solution in an upcoming post. Kent, as the gotdotnet site no longer has your code, could you post it somewhere? Exception Details: System.Runtime.InteropServices.COMException (0xC0C025CA): Instance of the WMI class is not found. 1. Access permissions have been denied to the current user. Either log on as a user that has been granted permissions to SQL and try again, or grant the current user permission to access SQL Server. 2. The SQL Server does not exist or an invalid database name has been specified. Check the name entered for the SQL Server and database to make sure they are correct as provided during SQL Server installation. 3. The SQL Server exists, but is not currently running. Use the Windows Service Control Manager or SQL Enterprise Manager to start SQL Server, and try again. 4. A SQL database file with the same name as the specified database already exists in the Microsoft SQL Server data folder. This is most likely a security related issue. The process of extracting Message bodies out of the BizTalkDTADb requires elevated privelages. I do not explicitly recall the permissions needed, but I would start by adding your user to the BizTalk Server Administrators group that is used in your remote environment. Internal error from OLEDB provider: "Login failed for user 'NT AUTHORITY\ANONYMOUS LOGON'." So, the issue maybe somewhere else. Any other ideas? The BizTalk sticth utility which you mentioned is not available in GotDotNet website nor in MSDN code gallery. Can you send me the tool if you have downloaded earlier? Can you leave me an email address and I will be sure to send you the utility that use to be on GotDotNet.